As I continue to learn my way around my bread machine, here I come with some bad pictures of some nice Herbed Potato Rolls I tried. Used the dough setting of my bread machine to knead the dough. 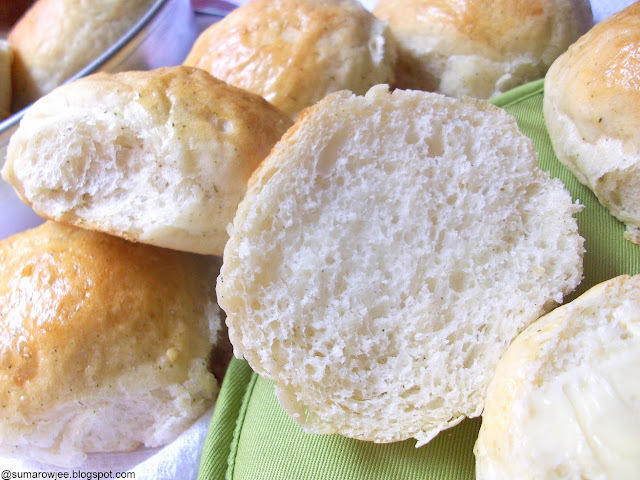 Just dump all the ingredients, set the dough cycle and then later just shape them into rolls, let them rise again and bake - what fun! Made this bread twice more, once in time for the kids to take them to school for the snack break. Once as a loaf with mint, coriander and cumin. And all I had to do was set the dough cycle on the delay start timer to have the dough ready by 5.45 am. To have a machine do all the dirty work at your bidding to get some fresh home-made bread - am loving this! Freshly baked, the thyme specked rolls were quite moist and tender, smeared with some soft salted butter, they were yum! 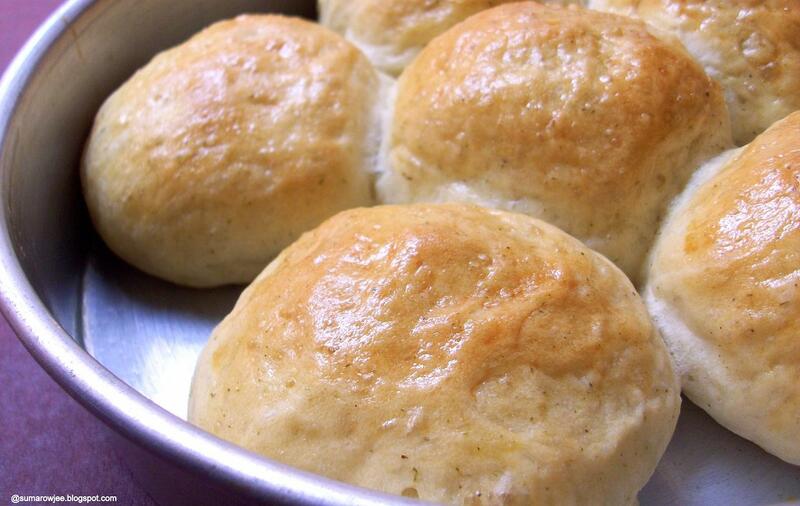 These rolls have potato flakes in the dough which makes them tender without any perceptible taste of the potatoes. Apparently, potato flour adds starch to the bread, which will attract and hold water, making the bread moister, help keeping it fresh longer. You could also use potato flour which is dried ground potatoes. Very handy to have them in the pantry indeed! I normally don't like using potato flakes in my cooking, but I guess it will be a staple in my grocery list from now on. Milk powder in place of milk helps get the color, protein milk imparts without fear of milk going sour specially when you use the delay start timer or during long rise periods. The protein helps enhance the structure in high rising loaves. Source - KAF Book. Here goes the recipe adapted from the King Arthur Flour site. Rosemary and poatoes are supposed to be a match made in heaven, but I have to admit, rosemary is just not my thing. I normally have dried thyme on hand and it invariably makes its way into my breads! I know you will hate me for writing the procedure and even the list of ingredients in bread machine order, but I guess I have a long way to go before I can give you both ways of making this and the last thing I want to do is write incorrect instructions, I hope you will bear with me and also correct me if I am wrong! Procedure : Place all ingredients into the dough pan of the bread machine in the order recommended by the manufacturer. Select the dough cycle and press Start.Check the dough consistency 7 minutes into the first kneading cycle. The dough must be soft and smooth, very slightly tacky. Add water or flour one tablespoon at a time to adjust the dough if needed ( I did not need to). When the cycle is complete, grease your hands, transfer the dough to a lightly greased surface. The dough will be slightly sticky. Fold the dough over a few times to expel any excess carbon dioxide. then divide dough into 12 equal pieces. You could let the dough relax for 10 minutes to help shape easily. Grease your baking trays or tins . I used one 9'' round tin and another 10x6 tray. 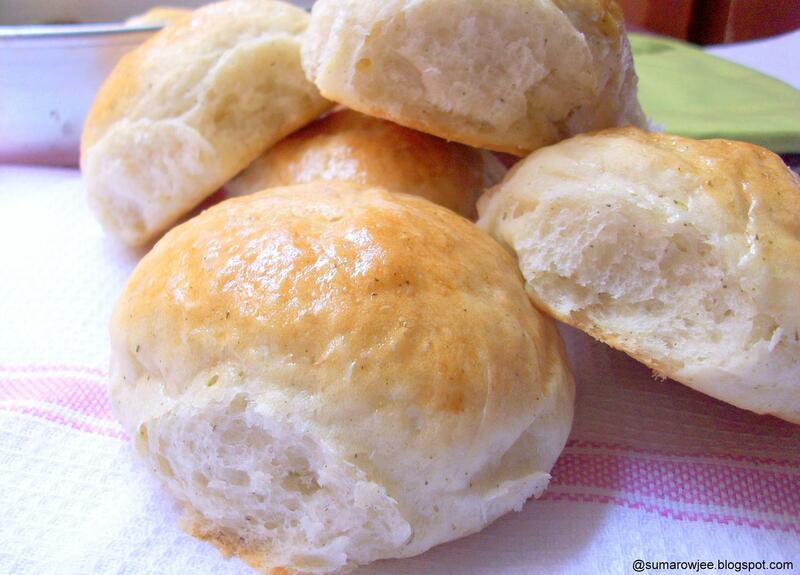 Shape the pieces of dough into rolls. Or roll each piece into a 10'' rope, coil each rope and tuck in the end so that it pokes up in the middle. 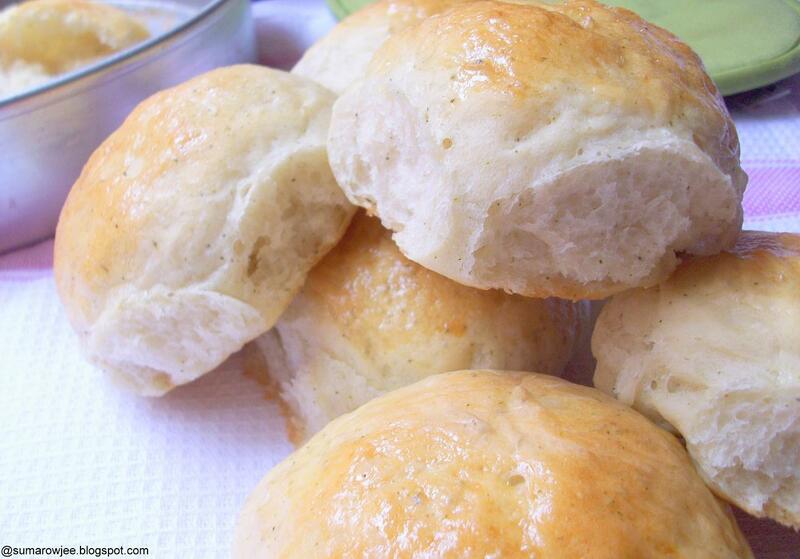 Place the rolls 2 inches apart, place it in a warm place to rise for about 45 minutes or till double. Towards the end of the rise period, pre-heat oven to 190 degrees C / 375 F. You could brush the tops of the rolls with beaten egg (I did). Bake for 15-20 minutes or till golden brown. Mine took about 25 minutes. Remove from the oven, cool completely before serving. Note: Potato flour can apparently be substituted with equal quantity of cornstarch or cornflour, do try that if you do not get potato flour/flakes. These look absolutely soft and yum ! I am sure you are having a great time with your bread machine...enjoy it ! Is there any substitute for potato flakes? Don't have a bread machine, but have to try them anyways! Good pics! Feel like making one now! Where do you get the potato flakes? WHat breadmachine is this? Please recommend!!! @Sai - I use a Westbend HiRise from the US. You could check Kenwood and other brands locally available. Do be very careful if you buy from the US as using an adapter always doesn't help. Hi Suma, after your feedback, I am planning to order a WestBend Hi Rise bread machine from US. I just saw that you have mentioned "using an adapter in India doesnt help always". I plan to buy a voltage convertor along with it. What else can you suggest me to take care of, before buying it for use in India? Looking forward for your reply! @Aditi - You can try using a converter, mine works alright. But not as good as it works in the USA I have heard. Nothing much apart from that. You may want to get standard sized loaf pans (9x5) from the USA if you don't already have them. Do check Kenwood in India before you buy.